It’s strange how one single item can bring back all the pizzaz you felt like you were missing in your style. Or maybe that’s just me, but this skirt really has worked wonders for my groove. Pleated skirts have been a wardrobe staple of mine for years. But ever since I accidentally ruined my beloved black pleated mini skirt from Oasis (seen here, as well as in tons of other pictures & posts) by spin drying it in a launderette almost five years ago, I really felt like that there was a basic missing in my wardrobe. I’ve been looking for the next best black pleated mini skirt ever since, and am yet to succeed. But oh my, this one has come so damn close. I found it 100% by chance last month – which sometimes seems to be the best way to find something you’re looking for – while browsing a local boutique in my hometown in Spain. It’s a Norwegian brand called Vila, which I’m vaguely familiar with as it’s sold on ASOS, but as I picked it from a ‘Last chance to buy’ type of rail and it was reduced to 15 euros, I have no idea from what season it could be. Coat, Daisy Street (seen here). Jumper, Dorothy Perkins. Skirt, Vila. Earrings, Jade Evans (available here). Bag, Topshop. Boots, Miss Selfridge (from 2017, seen here). Beanie hat (seen here) and gloves, presents from my mum. I wasn’t sure at first about the colour because my heart has been set on black for so long – and I have a difficult relationship with navy to say the least – but so far it hasn’t stopped me from wanting to wear it all the time! I don’t usually like pairing black and navy, but as one of half of the waistline is black (for this outfit, I wore the black part on the back – yes, I’m wearing this skirt both ways! ), I feel like that small detail can actually tie in nicely with black items of clothing and even black tights. On this occasion, I brought out my navy tights! 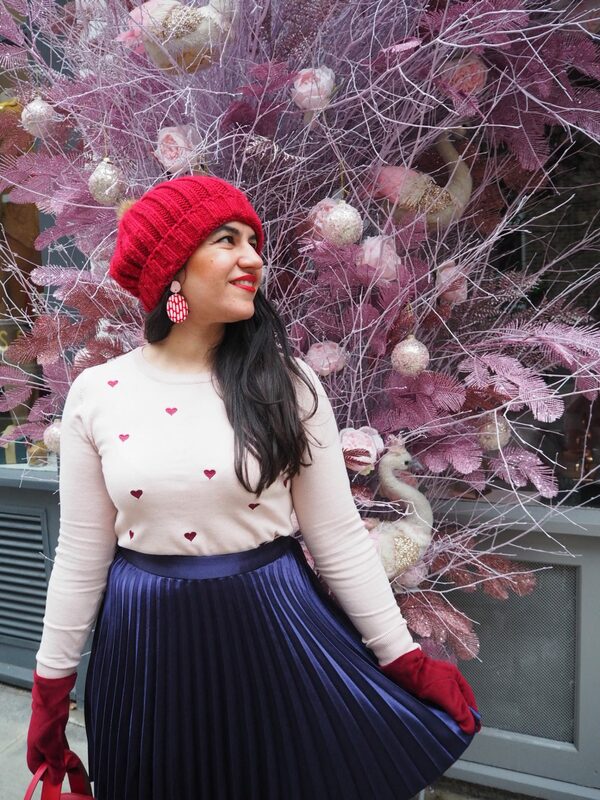 I also loooove the fabric – and even though I am yet to wash it (when it comes to the quality of an item, that’s one of the main tests for me ) I have to say that this little skirt feels very well-made. 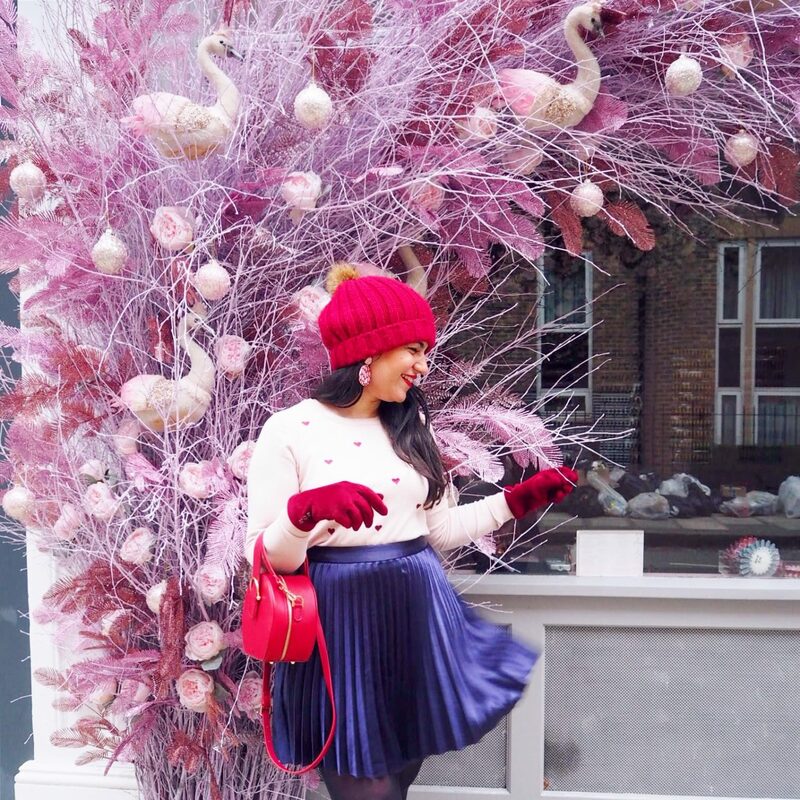 This was actually my last #ootd of 2018 – I wore this on the 31st of December for a friend date and by chance stumbled upon this beautiful setup at the nail salon Nail’d It, close to Sloane Square. I don’t know how it wasn’t all over Instagram! 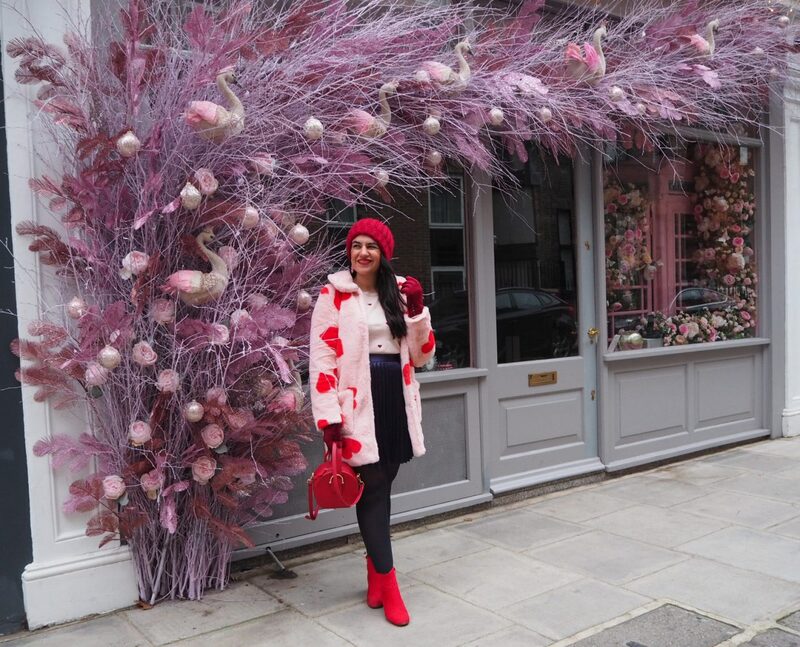 And yes, I’m pretty pleased that those pink flowers and possible peahens (Don’t quote me on this, I’m no bird enthusiast) sort of complemented my outfit. 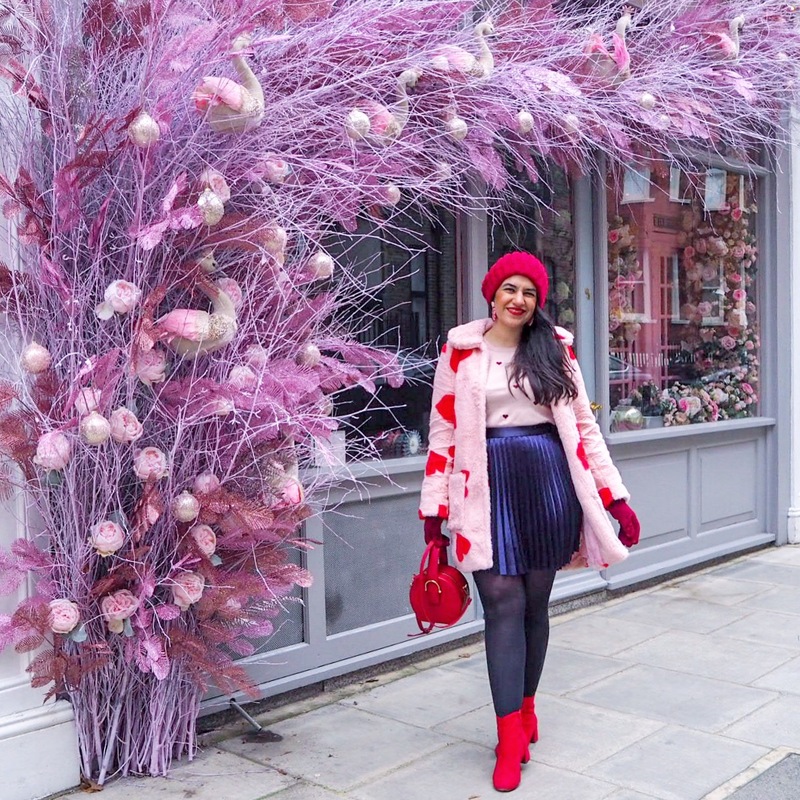 In fact I love how matchy-matchy this outfit is – maybe when sharing it on Instagram I should have said something lame like “Matching into 2019 like…” I think that’s one of the main aspects of my style, and something I definitely want to stick to in 2019. 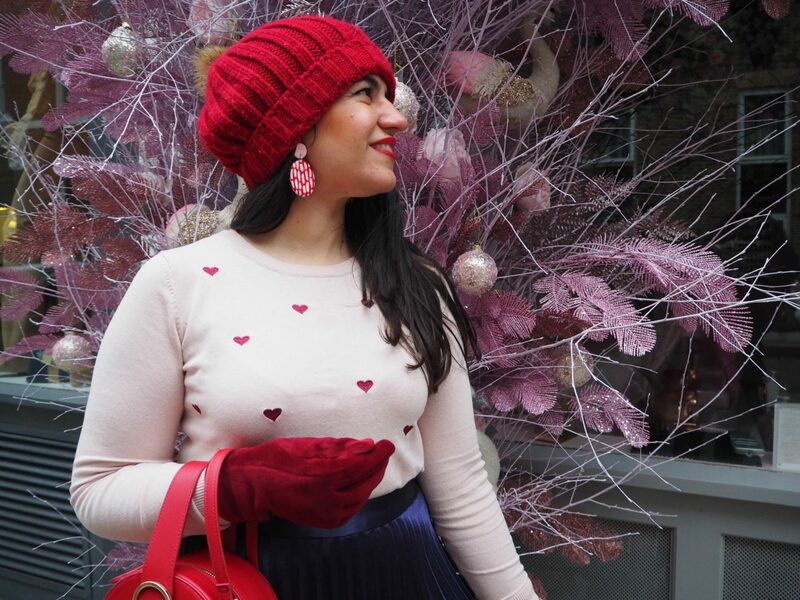 Maybe it’s the little things in life, but I just find matching so satisfying and felt happy wearing this outfit – I don’t think that’s a coincidence! This jumper was actually a Birthday present from a friend, who got it so right! 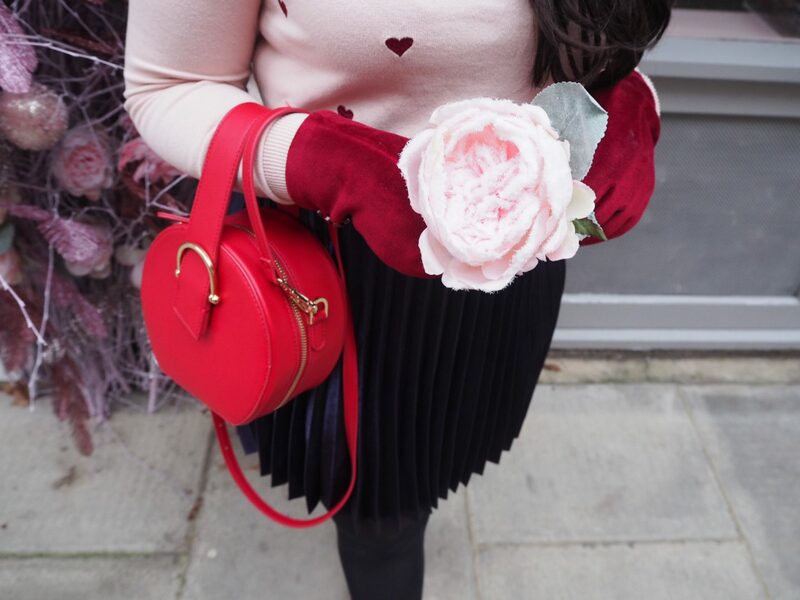 And no, I don’t think she knew that I have a pink coat with red hearts on it – this is next-level matching. Furthering my obsession with pink and red, I couldn’t help getting these earrings. They’re from a designer called Jade Evans who I found on Instagram – I love how colourful they are and the subtle retro vibes. Also, it’s not often that earrings actually manage to peek out of my ridiculous mane, but luckily these babies manage to steal the show! 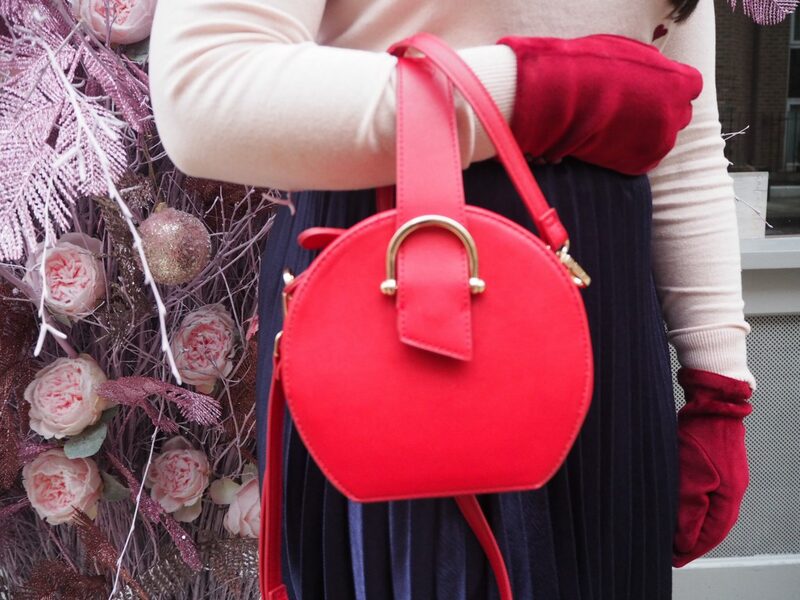 I’d had my eye on this little red bag from Topshop for months when last month it went in the sale – I had to grab one for both myself and my friend. I just love the round shape and all the detailing on it – was it the brand Staud that made something like this? I’m hopeless with subtle fashion dupes. I would actually love a Staud bag but for now high-street bags will have to do. And as for the beanie and gloves, they are presents for my mum. She got me the beanie back in 2017 (it was all over my Instagram for weeks) and she actually got me the gloves as a Christmas present in 2018 because she thought I could match them with the beanie. At first I said “There’s no way I’m going to wear the gloves with the beanie, they’re completely different styles.” Eating my words I am. So this is how I got my groove back. It’s nice to have ended 2018/started 2019 without a style rut by adding one key item and getting lots of joy out of fashion again. 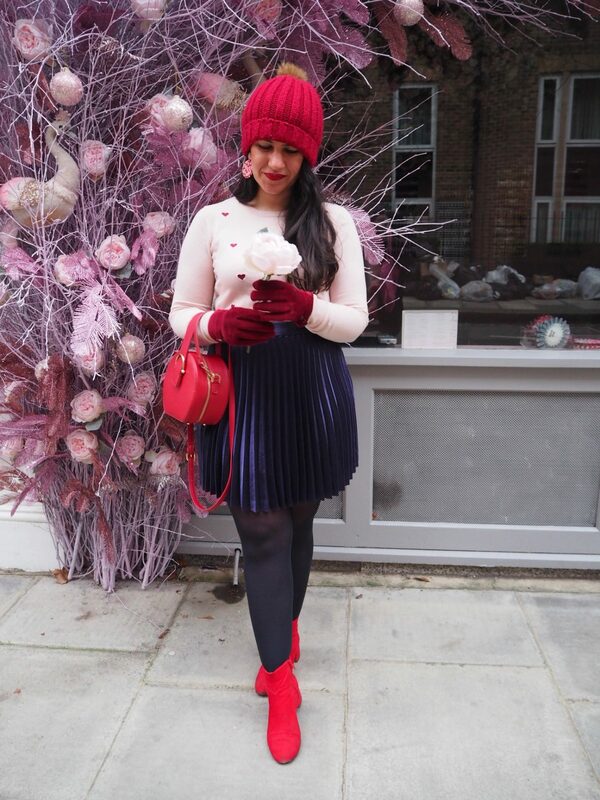 Because what’s not to love about pleats, minis, furry pink coats and red accents? 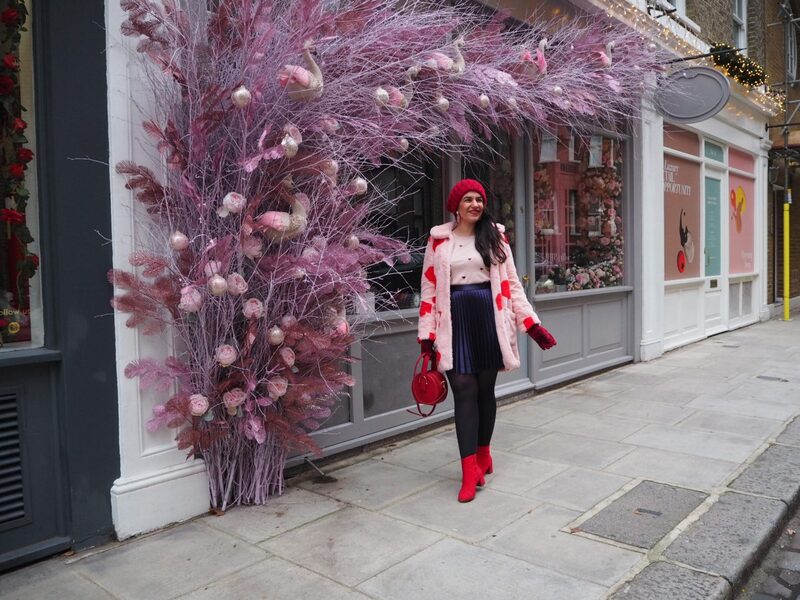 Pictures taken on December 31st, 2018 on Ellis Street, Belgravia, London.